and preparing it for potting. 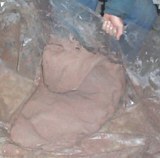 You can easily prepare 50 to 100 pounds of clay at a time using this method. 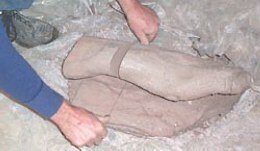 Notice how the mass is made up of many small clumps of clay. 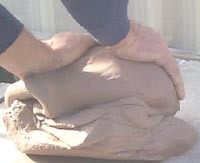 Allow the clay mass to air and dry further. 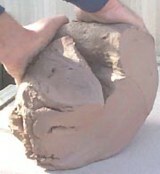 If the edges begin to get hard, cover loosely still allowing the clay to breathe. One or two days should be sufficient. Now the mass has been turned over and resembles a taco shape. Cover the mass with the plastic. All of the air bubbles need to be removed. Ken places his covered mass on the floor and walks on it. 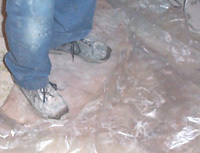 He compresses the clay by walking on it, pushing the air bubbles out. Unfold the plastic, re shape into a ball, re cover, place on the floor and repeat the process. it can be cut into blocks and placed in a covered plastic container until ready to wedge. 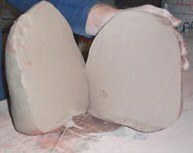 Cut the clay into manageable pieces approximately 10 to 20 pounds each. 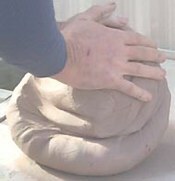 continue compressing the top of the clay inward. towards the center of the mass. 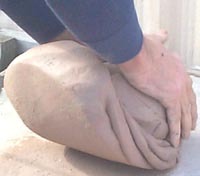 As with dough, continue until you have worked all of the air from the clay forming a ball. If bubbles are present repeat the wedging process. This can be disastrous during firing. hit other pieces causing the kiln load to shift and fall. checking for air bubbles and clay consistency.